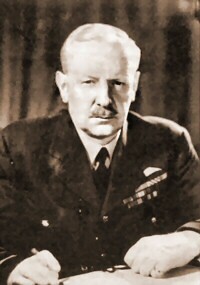 Arthur Travers Harris (1892-1984), known as "Bomber Harris," was appointed Commander-in-Chief of the Royal Air Force Bomber Command in February 1942. He was the mastermind of the indiscriminate area bombing of German cities from 1942 to 1945, during which time over 850,000 tons of bombs were dropped on German cities by the RAF at night. It has been estimated that 600,000 German civilians were killed in the bombing raids planned by Harris. Harris began with Lübeck, a picturesque Baltic port of no military importance. On March 28, 1942, about 400 tons of bombs were dropped on the city, two-thirds of them being incendiaries. The aiming point was the heart of the old town, with its densely packed, half-timbered medieval housing. 3,400 buildings were damaged or destroyed, and over a thousand people were killed. This was followed in April by similar attacks on Essen, Hamburg, Duisburg, Dortmund, and Rostock. It was after the devastating attack on Rostock (like Lübeck, a town with many medieval, half-timbered buildings) that the Germans began using the word Terrorangriff (terror raid) to describe the RAF attacks, and began to evacuate their children to the countryside. From July 24 to August 3, 1943, in a series of raids which Harris named "Operation Gomorrah," nearly eight thousand tons of bombs were dropped on the city of Hamburg, half of them being incendiaries. On the night of July 27 the fires grew so intense that the updraft of hot air pulled them together into a great vortex, creating winds of up to 155 miles an hour. Burning cars and uprooted trees tumbled through the streets, and even the asphalt pavement burst into flames as the air temperature reached 1800° Fahrenheit. Fifty thousand people died in this inferno. The Germans called it a Feuersturm (fire-storm). By the end of 1944 many German cities had been repeatedly and massively bombed, sometimes by more than a thousand planes in one night, all carrying incendiaries and directed against the residential areas, trying to reproduce the fire-storm of Hamburg. These attacks culminated in the infamous raid on Dresden on the night of February 13, 1945 (called "Operation Thunderclap") in which over 130,000 people were killed. Among the dead were thousands of children who had been brought back into the city that night for the Shrove Tuesday festival. Dressed in carnival costumes, their bodies were heaped in great numbers at the train stations where they had been brought to meet their parents. During all this time the British government told its people that only military and industrial facilities were being targeted in Germany, but in reality Harris (who by this time was being called "Butcher Harris" by RAF airmen) resisted every attempt to transfer resources from his area bombing of cities to more precise attacks upon military and industrial targets. After the war, when the true nature of this bombing became known, Harris was publicly villified as a war criminal, and in disgrace he left the country to reside for a time in South Africa, but he returned with impunity to England in 1953. He never expressed remorse, and he was never officially called to account for his actions. It seems clear now that, despite the efforts of many military men and politicians to distance themselves from what had happened, Harris had pursued his policy of civilian bombing with the knowledge and encouragement of the wartime Chiefs of Staff and of Prime Minister Winston Churchill. 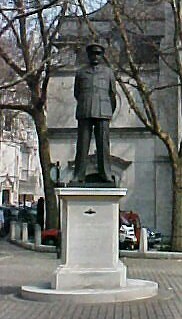 After his death, the Royal Air Force erected a bronze statue of Harris outside the RAF chapel in London (St. Clement Danes church). The statue was pelted with paint and refuse by protestors, and had to be put under 24-hour guard.